Ten years ago, a date with my husband-to-be involved excited anticipation, googley eyes, hand-holding that made my heart pitter pat, vanilla chapstick, a spritz of Chanel No. 5, and some wonderful first kisses under the oak tree. No, I didn’t wear a poodle skirt; yes, I was a bit of a dork. Fast-forward ten years, add in faraway lands, piles of blowing dust, a toddler, twin babies, and chronic exhaustion and a date is far less likely to happen, let alone rival a “Leave it to Beaver” episode. But it’s not out of the question! Recently, my husband had the day off, Bean was back in nursery school, the babies were heading off for their morning nap, and the nanny was completely in charge. So we did the unthinkable! We went on a morning date. We bathed, dressed up (meaning no mystery stains), I dug out some earrings, and we jumped in the car. 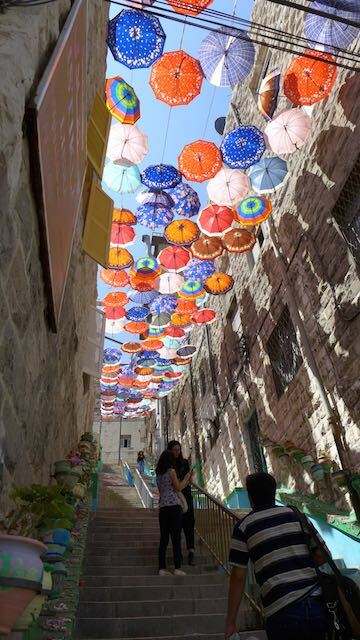 Our goal was to have brunch at Hashem Restaurant in downtown Amman, and see the staircase with the umbrellas. We followed the GPS, which got us close enough that we felt we could walk, not knowing the parking opportunities closer in. So we found a pay-lot near First Circle off Zahran Street and started our trek down the hill. We passed down the pet store street with the sad barking dogs and tweeting birds behind locked gates. This lead into gun alley, with the gun shops, also closed. It was almost 10:30am and yet the city was barely stirring. I found myself wanting to look around and see the old buildings or peek into the doorways and alleyways we were passing, but the hill was too steep and the sidewalk too uneven and broken for me to take my eyes off of it for fear of a broken ankle. I was taking it slowly and at one point my husband looked back and said, “Are you sure those were the best shoes for a hike?” I looked down at my Sanrah croc sandals with the vamp straps and silver-tone circle cutout and answered, “I thought this was a date, not a hike!” It is true; romance never dies. Twice, I nudged my husband to ask a passer-by if we were headed in the right direction. Twice, we were told some mush-mouth directions that involved “straight” and then “left”. We kept on trekking. We finally made it to the bottom of the street where it intersected another street, chose the left fork and within minutes I said, “There are the umbrellas!” And there they were! For some reason, some creative inspired person or persons took it upon themselves to adorn a steep set of stairs with an assortment of colorful umbrellas, hanging on wires. I have no idea who or why they did this, nor whether it’s done every year. But I loved it! Luckily our destination of Hashem Restaurant was just around the corner. It’s alleged to be the oldest restaurant in Amman, and has been run by the same Turkish family for generations. Regardless of all that, it is a classic dive restaurant with great food. The plastic tables and chairs are set up in an alley, essentially. We wandered in and were offered a table, but I asked if we could sit in the shade. So the man lead us back to another table with a couple already sitting at it and indicated we should join them. So we did. He made a cursory wipe of the crumbs, then looked at my husband who said, “Two for breakfast.” No menus here. We made chit-chat with the other couple, who happened to be visiting from Saudi Arabia, while we waited for our food and they finished up theirs. By the time they were done and leaving, our plates were coming out. First we both received a blank piece of paper. I quickly realized this was to be our plate. Then bowls of hummus, falafel, fuul (mashed broad beans), French fries, and a plate of raw onion and tomato landed on the table with great efficiency, and the empty basket was quickly filled with fresh warm pita. My husband opted for the tea with mint (there’s no coffee served), but it was too hot for tea, so I chose a soda. Meal received. Dig in! As I see it, there are two reasons Hashem has been around for decades: They serve delicious food quickly. And as an added bonus, it was about $10 for everything. Can’t beat that! After eating and paying, we opted to wander a little bit since we hadn’t ever explored this area of town on foot. It’s not far from the Roman Amphitheater (according to the signage), but we’d only just driven these streets. Walking opens them up for true exploration. We then headed over to the umbrella staircase. I feel it needs a better name, but I’m not coming up with anything lyrical currently. From the time I had first heard of it, a month had passed so some of the umbrellas had been off-set or blown away by the wind, but there were enough there to make it so very very worth it. We climbed up, took lots of pictures, tried to get out of the way of other people taking pictures, and thoroughly enjoyed the explosion of color. 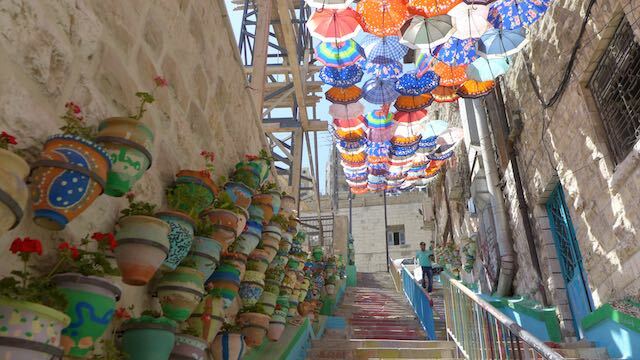 In addition to the umbrellas above, the walls were lined with painted flower pots all holding geraniums. The whole thing was lovely. Feeling I’d had my fill, we started the trek back up the hill towards our car. A few blocks in we made one final stop – at the paint store. I wanted a small pot of white paint. Purchase made, resume date. The hills in Amman rival San Francisco. And while going down them requires some concentration, hiking up them requires a lot of huffing and puffing. And with our tummies full, carrying a bag of walnuts and a pot of white paint, and with the heat of Jordan’s summer blasting on us, we opted for a quick cab ride to the top of the hill. It took us a while to get someone willing to stop, but one finally did, drove us about five minutes straight up, we got out, paid and thanked him and walked the rest of the way to our car. Since those early June-Cleaver-esque dates we’ve definitely gone beyond dinner and a movie. And as much as I love the movies, it just can’t top a date that involves a little getting lost, a chance meeting with some interesting strangers, some delicious food (even served on a piece of paper), great photo opportunities, and if we can cross an errand or two off my list, all the better. Here’s to more spontaneous morning, afternoon, or even midnight dates, Sweetie!